Alive! Calcium / 120 Tabs - Nature's Way®. 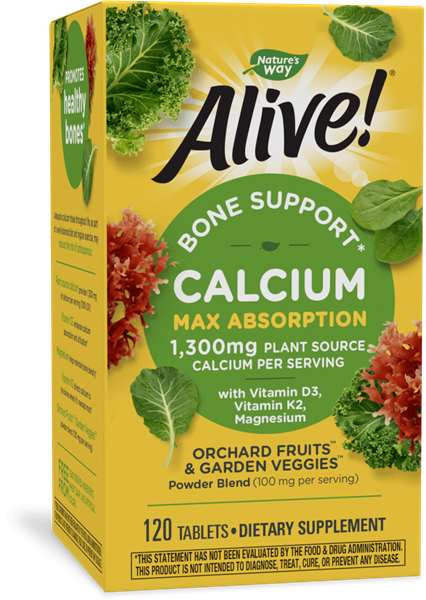 Alive!® Plant Source Calcium is derived from Lithothamnion (calcified red algae seaweed sustainably harvested from pristine Icelandic waters). While many calcium supplements are sourced from limestone rock or animal bones, Alive! Calcium provides Aquamin® calcium that may be easier for the body to digest, absorb, and utilize. ‡Trademark of its respective company. Consult a healthcare professional before use if you are pregnant, nursing, have a kidney disorder, hypercalcemia, hypercalciuria, or are taking Coumadin®‡ (warfarin), or any other medications.